The Liberal government, led by Prime Minister Justin Trudeau, says it intends to change the law to make it harder for refugees to go "asylum shopping". But legal experts and refugee advocates warn these changes could flout domestic and international law, and ruin Canada's reputation as a defender of refugees. "I think that the Liberal government has really taken a sharp turn," says law professor and refugee lawyer Warda Shazadi Meighen. 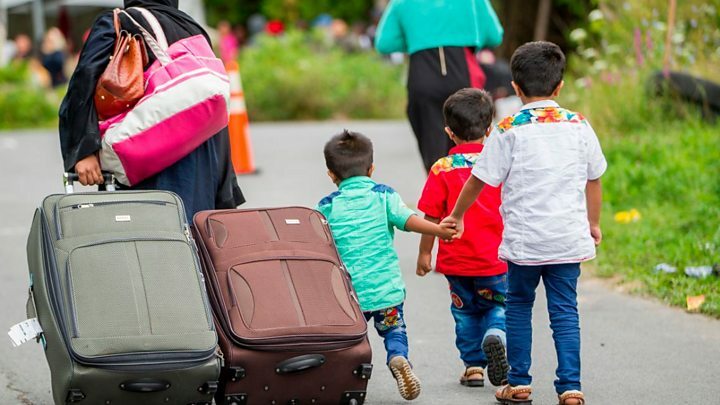 "Canada was really an outlier in the last five years as a country upholding refugee rights in the face of populism... and this will really chip away at that." Border Security Minister Bill Blair says the law is intended to curb "asylum shopping". Since Justin Trudeau's election in 2014, the country has earned an international reputation for being welcoming to refugees at a time when many other countries were cracking down on their borders. After US President Donald Trump announced a ban on entry to the US from seven Muslim-majority countries, Mr Trudeau tweeted that "Canadians will welcome you, regardless of your faith". Cities along the border have struggled with providing services to the thousands who are waiting for their claims to be heard - in Montreal, the Olympic stadium was converted into temporary housing. "It's a lot about optics really," she says. Refugee lawyer and law professor Jamie Liew says Canada should not be allowing the US - which does not accept refugee claims based on domestic violence or gender identity, unlike Canada - to make decisions that affect domestic refugee claims. "We shouldn't be relying on the decision of other country - Canada shouldn't be delegating that," she says. Ms Meighan says there will almost certainly be legal challenges, based on Canada's 1985 Supreme Court ruling that asylum seekers on Canadian soil were entitled to a full oral hearing before deportation. If the new law denies refugee claimants an oral hearing, she believes it will likely be overturned. But what will be forever changed is Canada's reputation on the international stage, she says. "I'm not sure if at the end of the road there will be much change, but it does change Canada's posturing," she says.